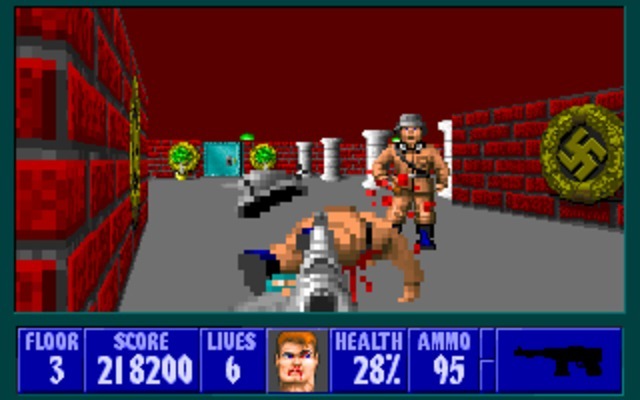 Wolfenstein 3D feels like a game that needs no introduction. But as time goes on, I wonder how many people only know it from its bullet points (Nazis, early first person shooter, 90-degree angle rooms) instead of having actually played it. There’s more to the game than the surface, and I think many people today, and especially in the future, would be surprised at how “modern” parts of Wolf feel. Once again, the early attempts astonishingly get a lot of things right the first time. The blood and swastikas got plenty of attention on release. 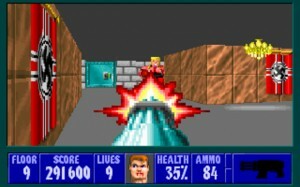 Wolfenstein 3D is a spiritual successor to an earlier top-down shooter named Castle Wolfenstein (hence, the “3D”). The premise of both is similar – you begin as a captured allied soldier trying to escape from the castle in which you are held. You’ll collect ammo and health to fight the guards in your way, and seek out keys for locked doors blocking access to the level’s exit. Wolf 3D expands this to six chapters and 60 levels total, as you steamroll through much more of the Nazi war machine. And yes, you’re going to find and kill Hitler. 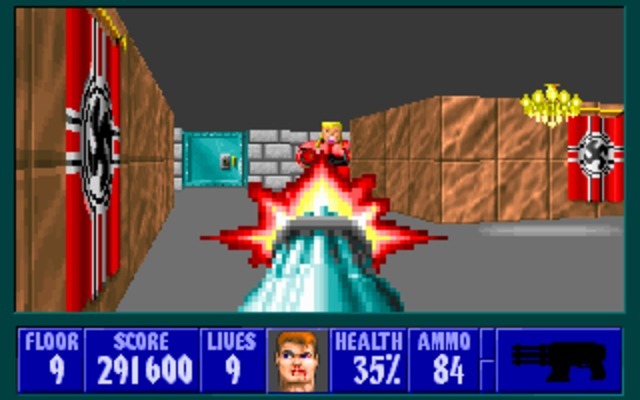 Wolf 3D was certainly not the first first-person-shooter. However, it was the fastest, and the most accessible. Previous first person attempts relied on wireframe graphics or monochrome polygons, which required a little more work on the part of the player to figure out what was a valid area they could walk to, and what was meant to be a solid wall. Wolf brought rooms with varying textures, and by drawing only what the player could see, displayed them at a speed that showed no signs of chop on a moderately decent computer. Further, there was Apogee’s brilliant strategy of releasing the first episode for free (as shareware), ensuring anyone who wanted to try the game was able to. Simply put, it was a graphical powerhouse for its time, ran like a demon on a Ducati, and it proved without a doubt that wandering freely inside virtual spaces was possible on the existing hardware of the day. 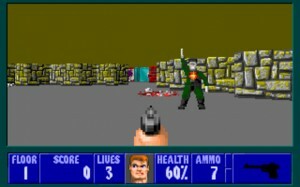 Granted, everything was stuck on a flat, single level plane, and levels were entirely designed around a grid, but it still gave computer owners an experience than no video game console had ever done up to that point, and gave developers an endless stream of ideas for games in this “new” first person view (enter the multitude of “Wolfenstein clones”). Many episodes have you going up against experimental horrors, like this mutant soldier. To an observer (and perhaps on the easiest difficulty setting), Wolf 3D looks like nothing more than wandering through mazes and shooting flat guard sprites that bleed. 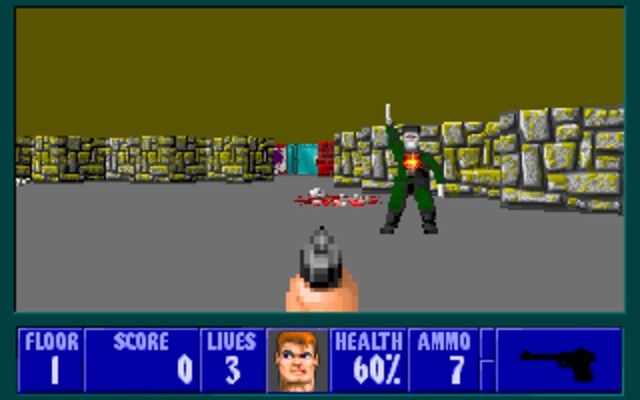 Wolfenstein wouldn’t be a success if this was the case, and it actually sets up many of the genre conventions that remained stable throughout the 90s and even into today. A great example the enemies with different looks that denote different abilities (a concept likely pulled from beat ’em up games of the late 80’s). The uniformed guards are hapless cannon fodder, dropped in one or two shots. But the burly SS trooper, or the nimble, white-suited officer, are threatening indeed. Multiple enemy types are mixed up within the same level, creating different challenges as you progress through the rooms. Weapons are probably the most limited here of any “typical” FPS, with only three to choose from. Each is an upgrade from the last, with your default pistol trading in for a more powerful machine gun, and ending with the mighty chaingun around boss fight time. 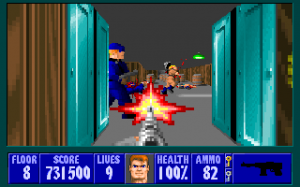 Later FPSs would add more nuance to their individual weapons, but Wolf still has a trick up its sleeve – a hard limit of 99 bullets at any time. There are no backpacks or way to carry additional ammo. This means you must ration your shots and always remain keenly aware of extra clips passed earlier in the level. You have to make the supplies on that level count, and reckless behavior finds you with no more health kits or bullets to pick up. Further, you’ll need to think ahead as the supplies you have are what you start with in the next level. Damage is also randomized, and appears heavily influenced by distance. Sometimes the standard brown guard will fall in your first shot, other times, he’ll take three or four. It also means you need to show some level of caution when moving through the levels. If you rip through the levels mindlessly, you’ll simply run out of ammo, or run into an enemy and get quickly killed. 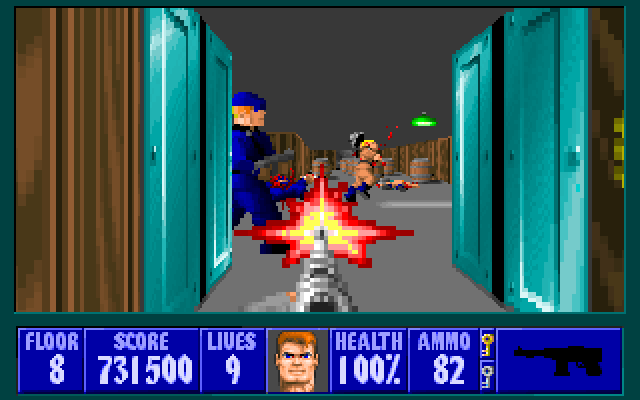 Get shot point-blank by the guard hiding by the door, and you’re suddenly losing half your health with each hit. Enemies can also shoot through each other, which can cause problems in large groups. As you shoot a bullet sponge (like a burly SS guard) before you, his buddies behind him are free to run your health down unscathed. Protip: There’s always more guards than you think there are. Finally, the guards aren’t that dumb. The AI is by no means advanced, but they can still surprise you if you’re expecting nothing more than dumb cardboard cutouts. Enemies react to sound, and will try to move toward the location of the last gunshot they heard. If you’re shooting up one room, the guards in the two rooms nearby may pop out of their doors. Further, they will not file through the same door if the architecture allows, often splitting up and ending up flanking you. Some guards have patrol routes, and can surprise you through a door even if you haven’t been causing a ruckus. Quite a few times I got shot by the unseen guard that “got away.” Finally, id is known to place them deviously in spots that surprise you, and again, point blank shots are exceptionally damaging to your health. Graphically… sure, it’s dated. Floors and ceilings have no textures. Decorations are simple sprites that rotate to match your position. Maps are nothing more than single-level collections of square tiles. Yet the texture-mapped walls and the detailed characters are still impressive. Wolf 3D also uses sprite scaling to great effect, so characters and objects shrink when you’re far away and get larger as you approach – through forced perspective it makes it seem as if they are actually in the world. However, because of the limited resolution, they crumble into oversized pixels up close. I find this forgivable, as the backgrounds aren’t high-resolution either, so it’s not terribly world-breaking. About the only real complaint is that the engine only does 90-degree angles, so every level is unabashedly a maze. Some care has been taken to mask this with decorations, and many rooms have a thoughtfully-suggested purpose like office, dining area, or stone-walled dungeon (though those three are admittedly overused). Many of the textures are quite nice as well, giving an opulent oak-hewn look to some levels, or majestic (in comparison to the rest of the game or the dungeon you start in) hallways and ballrooms. Still, it’s a maze, accentuated by the lack of an in-game map. Repeated areas and textures make it even easier to get lost, and though the levels are small enough that this isn’t a serious issue (you won’t need a hand-drawn map, ever), there will still be periods of wandering around and looking for where to go. Boss fights always have you trying to hit and run against a vastly overpowered, enormous foe. Sound is effective as well. Your blue-eyed blonde-haired Aryan guards shout various German phrases at you when they detect you, and spout other, authentic, but totally misplaced, phrases when they die (“Mein lieben!”). Boss characters also get a specific German introduction and death line, which helps to further set them apart from the grunts. These shouts are also helpful from a gameplay perspective, as you can tell what enemy type approaches by their distinctive alert phrase. If you fire and hear a roomful of “Schutzstaffel!”s around the corner, it’s time to run because the machinegunners are closing in. It’s worth noting that Wolf 3D sits at the edge of arcade action and meatier “home” experiences. The inclusion of points and lives here seems outdated already, and certainly doesn’t factor into the gameplay. This is a game where you win by making it through the levels and defeating the boss, not by having your name on the high score screen, so treasure hidden behind moveable walls seems unnecessary. Likewise, you can freely save your game at any time and reload when you die, making your score and the extra “lives” it bestows even more useless. 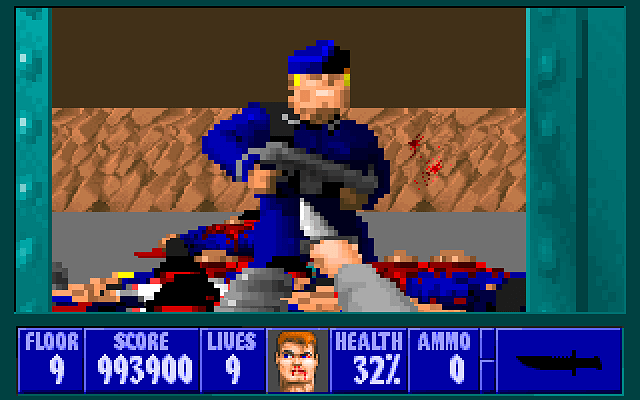 So that’s Wolfenstein – a slightly more advanced game than you’d think, and a rightful progenitor of the modern FPS. Unfortunately, Wolfenstein was also so successful that it quickly became obsolete in the very genre it kickstarted. It presented an adrenaline-fueled concept and a marker for technology all in one package, but left later games to offer more realistic-looking engines or more exciting gameplay gimmicks. And its hard to believe, but technology was moving so fast that Doom was released just a year later, and would go on to be the real poster child for the genre. Groundbreaking, standard-setting FPS. Multiple enemy types share the same level and display some basic AI. Randomized damage keeps you on your toes. Still runs on just about anything. Little difference between your weapons. Areas are low on decoration and high on being simple mazes. No maps and few textures overall can lead to a lot of confused wandering.